You'll be £4.99 closer to your next £10.00 credit when you purchase Hitler Was My Friend. What's this? As official 'court' photographer, Heinrich Hoffmann played a critical role in the painstaking cultivation of Hitler's public image and the glorification of the Third Reich. However, his influence stretched far beyond the realm of propaganda. Not only was he present during many of the key moments in the history of the Third Reich – he was also a close, personal friend of the Führer with exclusive and intimate access to Hitler's inner circle and to the man himself. It was Hoffmann who introduced Hitler to Eva Braun, his studio assistant. He took over two million photographs of Hitler and published several books including The Hitler Nobody Knows (1933). At the end of the war, Hoffmann was arrested by the US military, who seized his photographic archive, and was sentenced to imprisonment for Nazi profiteering. His memoirs are a crucial eyewitness source for the historian and general reader alike, offering an illuminating glimpse of the dictator's personality and a remarkable, behind-the-scenes account of the Nazi regime. This edition includes a new Introduction by Roger Moorhouse. First printed in 1955 on his release from Allied imprisonment this fly-on-the-wall account by court photographer Heinrich Hoffmann documents Hitler's private life and inner circle. Loathed by Goebbels and Bormann due to his apolitical nature, the author was the Nazi leader's confidant and lightening rod. 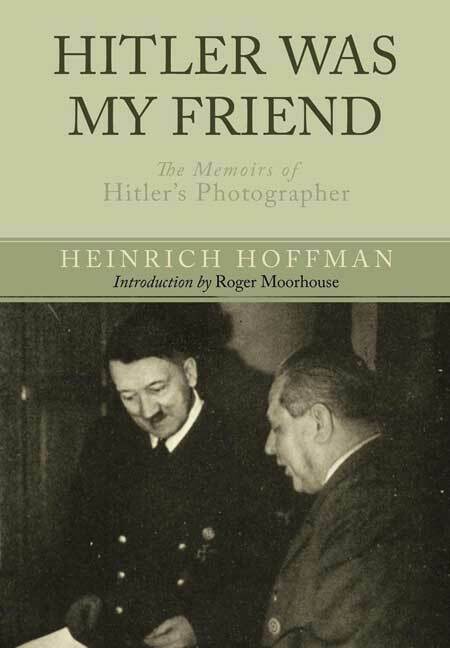 Hitler Was My Friend becomes increasingly absorbing as the dictator's numerous wartime crises deepen but do not expect insights on the major strategic or operational decisions as Hoffmann was neither present nor involved. A new edition of a classic book by one of Hitler's closest friends. This edition includes a new collection of photographs by Hoffman. The snaps survived the war and are now published alongside chilling and comical portraits of him in a book called Hitler Was My Friend. The bizarre images were never intended to be published but Hoffman included nine in this memoir. Don't mention the clothes – here's Adolf Hitler in a series of bizarre photographs which he kept hidden from the world. The photos were stored in Hoffman's studio until his arrest at the end of the Second World War, when they disapeared into archives. They have now been published in this memoir. The method behind the madness of Hitler's infamous rousing speeches had been revealed in an album of extraordinary photographs. An extraordinary new book of photographs of Adolf Hitler includes one that so embarassed him he banned it from being published. It shows the Führer in his lederhosen, striking an absurdly camp pose as he leans against a tree. Heinrich Hoffmann (1885–1957) began his career in his father’s photography shop. He became an official photographer for the army during World War One. He had a very close friendship with Hitler, and remained his official photographer until 1945. Historian Roger Moorhouse is the author of Berlin at War and contributed to He Was My Chief and With Hitler to the End.